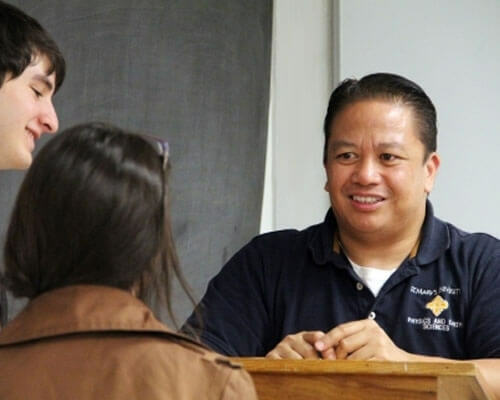 Home » Academics » Schools » School of Science, Engineering and Technology » Faculty » Richard Cardenas, Ph.D.
Richard Cardenas, Ph.D., joined the physics faculty of St. Mary’s University in the fall of 2000. He received his bachelor’s degree in physics and applied mathematics, and his master’s degree in applied physics. After earning his master’s degree, he worked in industry for Lockheed Technical Operations Company (now called Lockheed Martin Technical Operations) and Incyte Genomics. Cardenas has research interests in biophysics, medical physics and physics pedagogy. His main research area involves the study of the effects of radiation on aqueous polymer gel systems and their uses in radiation dosimetry. These aqueous polymer gels are tissue-like, hence are useful tools for modeling radiation response of various types of tissue. In addition to the polymer gel studies, he has done research in physics pedagogy in collaboration with Texas Tech University and Harvard University using the force concept inventory.